Technology forms the backbone of our manufacturing prowess. Utilizing a “family of parts” approach to properly align man and machine provides a cost effective solution to manufacturing high quality, complex components. We have defined manufacturing cells that specifically focus on product groups such as Landing Gear and Thrust Reverser Cylinders, Flight Control Pistons, Load Transfer Components and Assemblies, as well as smaller parts for Hydraulic Power Generation Systems. The first step in developing new components for our customers is identifying characteristics that form a best fit into existing families of parts. Whether it’s a flight control actuator piston or a hydraulic power generation component, we have manufacturing cells designed to accommodate a wide variety of products. Manufacturing pistons encompasses three distinct process loops. The first process loop is a self-contained “rough machine” cell that utilizes 4 axis CNC lathes and counter rotating gundrill machines to finish machine pistons up to 50” in length. The pistons then move on to the “outside process” loop for special processes such as heat treatment, passivation, and chrome plate. When the pistons return from the outside suppliers, they are delivered to the Grind department for finish grind, hone or any final milling. Before final inspection, pistons are deburred and cleaned up to complete the manufacturing sequence. 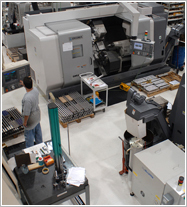 Cylinder manufacturing utilizes horizontal machining centers, 4 axis lathes and 4 axis vertical machining centers. The process can begin with forgings or heat treated bars up to 14" diameter and cut to lengths up to 46". 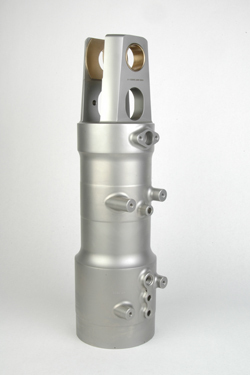 All of the major machining on the cylinders can be accomplished in five operations without ever leaving the cell. Our approach to complex cylinder manufacturing has allowed us to reduce lead times by as much as 75% when compared to conventional methods. The process of continuous improvements is also greatly enhanced as our machinists are focused on improvements that can be applied across the full range of similar parts. Manufacturing “small” shafts is split into two cells that include auto-loading 4-axis lathes, 5-axis lathes with live tooling (milling), and 4-axis vertical mills. The cells are setup to handle both low and high volume production of spline driven shafts and couplings up to 6 inches diameter x 10 inches long. The shaft cell feeds the gear department, followed by outside heat treat, inside magnetic particle inspection (NDT), shot peen, final grind, NDT, and final inspection. 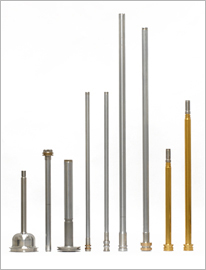 The shaft family includes materials such as stainless steel, alloy steel, copper alloys, titanium and more. 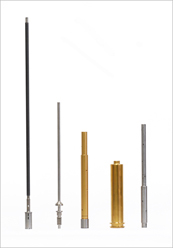 The outside heat treatments include age hardening, normalize and temper, quench and temper, carburize and harden, gas and ion nitride, nitrocarburize, and more. Our Mill-Turn Cell is comprised of various Mill Turn capable machines, including: 9 Axis Mori-Seiki MT, and NT models. These machines are equipped with 120 tool magazines, which allow us to capture setups resulting in reduced setup times and higher yields. These machines are truly a cell within a single machine. The majority of the parts produced in these machines are rough turned before they are delivered to the MT's. Because the machines are capable of transferring work from one spindle to another, the entire part can be machined in a single setup. The end result is a part whose features are related to one another within millionths of an inch. Manufacturing complex housings requires a substantial investment in capital equipment. We employ Horizontal Machining Centers tied together with a rail guided vehicles, a 5 axis Vertical Machining Centers and a 9 axis Mill / Turn machines. This collection of machines enables us to manufacture extremely high quality, complex components from hydraulic control manifolds to electric motor housings for today's most advanced aircraft. Manufacturing “Long” shafts begins in this cell that has been setup with 4-axis and 3-axis lathes. This cell is designed to handle low to medium volume production runs of pistons, shafts, or acme lead screws up to 6 inches diameter x 60 inches long. Once an acme lead screw is processed through this cell, it is moved to a thread grind department consisting of Reishauer thread grinding machines. The acme thread is ground from solid, deburred, and sent outside to gas or ion nitride. Upon return, the screw is magnetic particle inspected (NDT), shot peened (as required), finish ground, final NDT, and final inspected.